A little while ago, I was asked to review a new wine book. 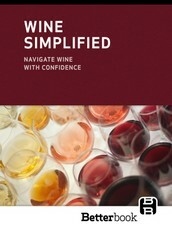 The book, Wine Simplified, was written by Marnie Old and Anthony Giglio. 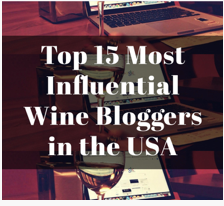 I have never met Anthony, but he is a respected wine author and writes for Food and Wine magazine (among others). Marnie, on the other hand, is a very familiar presence in the Philadelphia wine scene. Several years ago, when I was first getting serious about wine, I helped out at some of the regular tastings she conducted here in the city. I have run into her several times since then and she is one of the nicest and most wine-savvy people you could ever meet. Thus, when I was asked to review her book, I gladly agreed. There was a bit of a problem—I had never reviewed a book before. 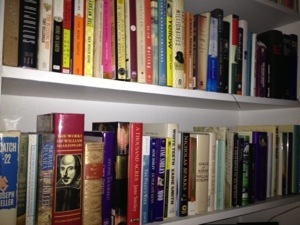 After my initial apprehension, I looked at my living room bookshelf, littered with hundreds of books, dozens of them about wine, and I realized that I was a book person and I would be able to more or less figure it out. A few books in our living room. Another problem—Marnie’s book is an e-Book. This was actually a pretty big problem (for me). I had never, ever, read an e-Book. I do not own a Nook nor a Kindle, much less a ‘Kindle Fire’ and honestly, I am not sure if I ever will. I really love the feel of the book in my hands, the way the pages sound when your turn them, even the smell when they are a bit damp. I understand that the world is moving in the direction of e-Everything (I long ago stopped buying CDs—do ‘record stores’ still exist?) and normally I would be on board since I am a bit of an Environmentalist (have you hugged a tree today?). There is just something about a ‘real’ book that I find enticing. My wife does have an iPad, however, which I always thought was cool, but I never really saw as all that useful—I had my laptop, after all. The night before our flight out West to visit her family, I asked my wife to download Marnie’s Wine Simplified onto her iPad since I figured I would have a lot of time on my hands over the course of the next week (not to mention the excruciating six hour flight each way). There was a boatload of other reading I wanted to do, including finishing Vertical (the sequel to Sideways) and crack Wines of the Southern Hemisphere that was recently hand delivered after winning it on 1WineDude. This ‘vacation’ I would have my hands full with plenty of reading material (not to mention trying to write something once in a while), helping the week to pass quickly. We arrived at the airport and my wife looked at me and alarmingly asked where was my laptop bag. We both spun around looking for it–no where in sight. I ran back outside, but the cab had already hurtled off into traffic. After a few tense moments of frenzied questioning, I realized that I had left it in the living room at home. I contemplated blaming my wife or one of the kids for forgetting the bag, but the year was almost over and I did not want to blow my chances at either husband of father of the year (did not win either, apparently). I thought about taking a cab back to the house to get the bag, but we neither had the time, nor did I really want to spend the $80 to do it. As we headed for the gate, I actually felt a bit of relief since I was going to be a bit ‘unplugged’ for the week. Thus, faced with absolutely nothing to do for the entire week, both problems about reviewing Marnie’s book (the fact that I have never reviewed a book and my fear of not knowing how to ‘turn’ the ‘pages’) seemed rather insignificant. The kids were going to be playing with their cousins, my wife was going to be occupied with her family, and I was now going to have to do some ‘work for my blog’ so as to avoid saying or doing something completely asinine, causing my in-laws to wonder yet again what their daughter sees in me. I commandeered the iPad for the week and started reading Marnie’s (and Anthony’s) book. The rest of the Review will appear next week. This entry was posted in Wine and tagged books, Marnie Old, Wine Simplified. Bookmark the permalink. I’ve had a few of those frantic moments in airports. Mostly when I panic about where I left my purse, then realize I tucked it inside my carry-on. Yeah, we both freaked out for a good five minutes until we realized that neither of us put it in the cab. Then I calmed down (and after a cocktail). I would need a cocktail after that too! Not only do i prefer real books, I also like going to bookstores and the library. Seems easier to browse seeing everything in front of me like that. Will be interesting to know what you will think about this book, I got the same request, I got the same book, I downloaded it, I opened it – and it didn’t click (not literally, of course). I guess I’m a wrong audience for this book, so it will be interesting to know what do you think. As a side note, I’m mostly like you – I need to feel and touch the book, however, my wife, who reads 100-times more books than I do (she always reads), switched to the kindle in the instance. I gave her a kindle as a birthday present about two years ago, thinking that it will be easier to take one kindle than five heavy books when we go on vacation. She turned it on – and she never put it down since…. I have gone through a lot of it and it is very well done, but it is for the neophyte. I am not quite sure why they had bloggers review it…. Eagerly awaiting the full review, TDC! I totally agree with you on the preference to have actual pages to turn. Kip, however, reads as many books on his iPad as for “real,” so maybe I could be convinced. . . dunno, I’m going to wait to hear your final verdict. Perhaps the e-book format has swept you off your feet? We’ll stay tuned. The e-book thing was very cool, I have to admit. Maybe will woo me in this non-fiction kinda thing where you get all the extra features. Reading fiction? Still not sold. I use a free Kindle app on both my laptop and my phone. I love them. But I understand those who still love the actual book. Yeah, there is some definite appeal there…. Can’t wait to hear what the book is like. “Review” means detailed notes on every page right? (Just kidding?) Anyway, I do also appreciate a real book, although, I am an owner of a regular old Kindle–not the fiery stuff. I still pick up the old school, paper reading devices every once in a while. Flip through, smell their dampness, and appreciate their ability to be damp at all. My heart sank when I read your second sentence (and began immediately thinking of an excuse to put it off another week! Haha I was really just kidding! No worries. Put it off if you must, but still looking forward to hearing what you think about it!